Wetland Protection:� Grant funds will be used to permanently protect over 650 acres, 440 of which are existing wetlands. Wetland Restoration: �At least 100 acres of land that has been drained in the past will be restored to wetland conditions. Outreach & Education:� Brochures, newsletters and other outreach materials will be developed and distributed to educate landowners about the importance of preserving and restoring wetlands.� A variety of workshops and field days will also be held. There is also a St. Joseph River Wetland Partnership Project being implemented by the Friends of the St. Joe River Association with funding from the US EPA.� For more information visit the Friends website. 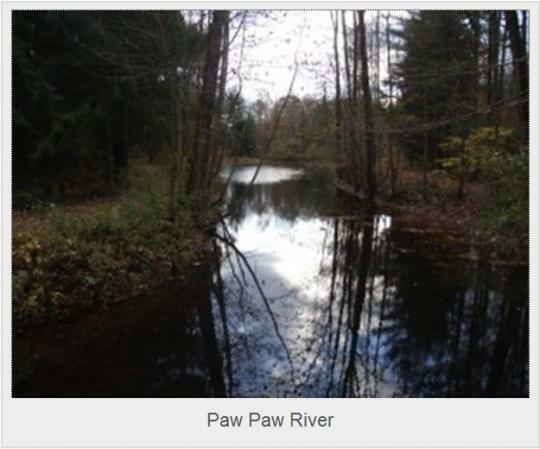 The Black and Paw Paw Rivers are two of the healthiest river systems in the southern Lower Peninsula of Michigan, even though much of the land in these watersheds was long ago converted from forests and prairies into farmland and, more recently, into development. Enough of the region's floodplain forests and wetlands have survived to act as filters, providing the region with a relatively clean water supply. However, continued development and land use changes in the area threaten the health of these natural resources. Despite the overall high quality of these river systems, some segments are considered impaired by Michigan's Department of Natural Resources and Environment. These new wetland projects will help reduce in-stream erosion and sediment loading, while promoting the infiltration of surface water into groundwater. The projects will not only protect our regional supplies of drinking water but will also improve wildlife habitat. "Wetland restoration projects promise to provide homes for all sorts of birds, frogs, mammals and other wetland-dependent wildlife," stated Nate Fuller, conservation and stewardship director of the Southwest Michigan Land Conservancy. "Animals considered rare in southern Michigan - such as mink, Eastern box turtles and prothonotary warblers - thrive in the Paw Paw and Black River watersheds. Some of the world's largest populations of federally endangered Mitchell's satyr butterflies and Eastern Massasauga rattlesnakes can be found in the wetlands along these rivers and streams, providing testament to the region's water quality." Together, the Black and Paw Paw River watersheds collect more than 1,200 square miles of surface water from an area stretching from Lake Michigan east past Mattawan, and from Fennville south to Decatur. The Paw Paw River - which begins in Kalamazoo County and flows through central Van Buren County - empties into the St. Joseph River just before it meets Lake Michigan at Benton Harbor. The Black River flows into Lake Michigan at South Haven, and its watershed is equally divided between the western portions of Allegan and Van Buren counties. As part of the effort to protect these two Lake Michigan watersheds and assist in the implementation of the management plans, a new organization was created: the Two Rivers Coalition. The Two Rivers Coalition will assist the Conservation District with information, education and outreach efforts during the project. Other partners include the Southwest Michigan Land Conservancy, Sarett Nature Center, Van Buren County Drain Commissioner, Van Buren Intermediate School District, Van Buren Youth Camp, Harbor Shores and Ducks Unlimited. These partners, along with individual landowners, will contribute another $800,000 to this project, culminating in over $1.6 million during the next three years for conservation efforts in the Paw Paw and Black River watersheds. Questions?� Please contact the Conservation District office at (269) 657-4030 x 5, or e-mail�one of the Watershed Coordinators, Matt Meersman (matthew.meersman@mi.nacdnet.net)�or Erin Fuller (erin.fuller@mi.nacdnet.net).